What is NCheck Bio Attendance? NCheck Bio Attendance is a popular, fast, and simple biometric attendance management solution. The system is developed using industry recognized Neurotechnology biometric algorithms that have been recognized and awarded multiple times. Basically, what you get is an industry standard compliant biometric software that adds precision to all your attendance management processes. NCheck Bio Attendance biometric attendance management software is compatible with a vast selection of industry standard compliant biometric readers. Whether you want to implement a face-scanner or a fingerprint identification system for your business or even a combination of multiple biometric components, NCheck Bio Attendance has all the tools to help you set up the attendance management system that you want. With NCheck Bio Attendance Software, you can be sure that your attendance management system only uses the best algorithm that is NIST-certified. 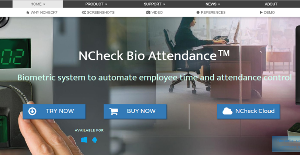 A popular biometric software that has raked in multiple recognition and awards for its strict compliance to industry standards, NCheck Bio Attendance Software helps you implement a more accurate attendance management system that can support fingerprint, face or iris biometrics modalities that are very difficult to manipulate or tamper with. Its advanced attendance management system helps you bolster the attendance rate of your employees and empower them to be very productive during their work hours. Plus, you also get to track their time and see where they are at any given time during their shift. Also, NCheck Bio Attendance Software works with multiple biometric capture hardware available in the open market, giving you that flexibility you need to pick best face, fingerprint or iris capture devices for your biometric attendance management system. NCheck Bio Attendance can run on standard Windows-powered computers as well as many of the available Android devices in the open market. You can easily install NCheck Bio Attendance in a Windows PC and turn it into biometric attendance device. The same thing goes for smartphones and tablets running on Android. What Problems Will NCheck Bio Attendance Solve? 1. NCheck Bio Attendance is not bound to any particular brand or manufacturer of biometric hardware. It supports more than 50 different fingerprint scanners or more than 3 different model of Iris scanner. 2. Most biometric systems crash and leave users with no alternatives. In case of NCheck, users can switch to any device or smart phone to mark the attendance of their employee using Face Biometrics by simply taking a selfie. 3. In case of remote workers customer often face problem of connectivity to main server or central server for attendance. NCheck provides both off-line and on-line facility to mark attendance. In case of internet is not present still the user would be able to mark attendance. If you are interested in NCheck Bio Attendance it could also be sensible to check out other subcategories of Best Employee Scheduling Software listed in our database of B2B software reviews. Each enterprise has different requirements and requires a system that can be personalized for their size, kind of employees and customers, and the particular industry they are in. For these reasons, no software can offer perfect tools out-of-the-box. When you look for a software product, first be sure what you want it for. Read some NCheck Bio Attendance reviews and ask yourself do you need basic tools or do you need complex features? Are there any industry-specific tools that you are looking for? Obtain the answers to these queries to assist your search. There are plenty of aspects that you need to mull over and these include your finances, particular business needs, your company size, integration needs etc. Take your time, use a few free trials, and finally zero in on the app that provides all that you require to improve your company effectiveness and productivity. How Much Does NCheck Bio Attendance Cost? We realize that when you make a decision to buy Employee Scheduling Software it’s important not only to see how experts evaluate it in their reviews, but also to find out if the real people and companies that buy it are actually satisfied with the product. That’s why we’ve created our behavior-based Customer Satisfaction Algorithm™ that gathers customer reviews, comments and NCheck Bio Attendance reviews across a wide range of social media sites. The data is then presented in an easy to digest form showing how many people had positive and negative experience with NCheck Bio Attendance. With that information at hand you should be equipped to make an informed buying decision that you won’t regret. What are NCheck Bio Attendance pricing details? What integrations are available for NCheck Bio Attendance? If you need more information about NCheck Bio Attendance or you simply have a question let us know what you need and we’ll forward your request directly to the vendor.